AO-X is the fourth generation adaptive optics from SBIG specifically designed for the STXL and STX series cameras to obtain the ultimate image resolution. The AO-X is designed for the STXL and STX series cameras. This unit get power and commands directly from the camera via a short cable to camera's I2C port. No other external cables are required for power or control. The I2C output port are fully compatible with other I2C accessories that you might add to the system such as a filter wheel. SBIG has exploited the second guiding CCD detector in our self-guiding cameras to stabilize stellar images, enhancing resolution. These AO systems use a tip-tilt transmissive element to correct for image wander due to low order local atmospheric effects and for correction of mount errors, wind vibration and other erratic motion of the optical system that is otherwise too fast for an autoguider or telescope drive corrector to respond to effectively. By monitoring a guide star with the smaller tracking CCD that is built-in to SBIG cameras, Self-Guiding Filter Wheels or the Remote Guide Head, the AO makes fine corrections at approximately 10 times per second to hold the image fixed on the CCD during the exposure. The system is closed loop, which means that it checks the position of the guide star after every move and makes adjustments on the next move. This results in a series of small, fast and very precise moves that continue over the course of a long exposure. This is possible because the guide chip is located behind the AO device and can measure the results of each move it makes. In the past, with the AO-7, this presented some difficulties when using narrow band filters because light from potential guide star candidates was attenuated by the narrow band filter to one degree or another resulting is guide stars that could be difficult to find or too dim to use. However, the new AO design and new camera improvements eliminate this problem. The new STT and STXL cameras place the tracking CCD in front of the filters, and the STX cameras support a Remote Guide Head that can places the guiding CCD anywhere in front of the filter wheel using an AO. Another benefit of the new AO design is that they take up far less backfocus. The former AO-7 required about 3.5 inches of backfocus and placed the camera at right angles to the optical system. Inserting an off-axis guider or other pick-off mechanism added even more backfocus. However, the AO-X requires only about one inch of backfocus. Additionally, the transmissive element of the new AO design has a relatively large range of motion. In the AO for example, the range of correction is roughly +/- 40 pixels. Assuming one is imaging at approximately 1 arcsecond per pixel, this means the AO can correct for up to about 40 arcseconds of periodic error in the telescope mount. Since most modern mounts with PE error correction are capable of reducing any residual periodic error within this range, it is possible to guide long exposures with the AO-8 without making any guiding corrections to the mount at all. Guiding in this manner is also far more accurate than can be achieved by issuing corrections to the telescope drive. The tilt of the element during operation does not lead to any image rotation or measurable defocusing at the edges of the frame, even when relatively large ranges of correction are required from beginning to end of the exposure. 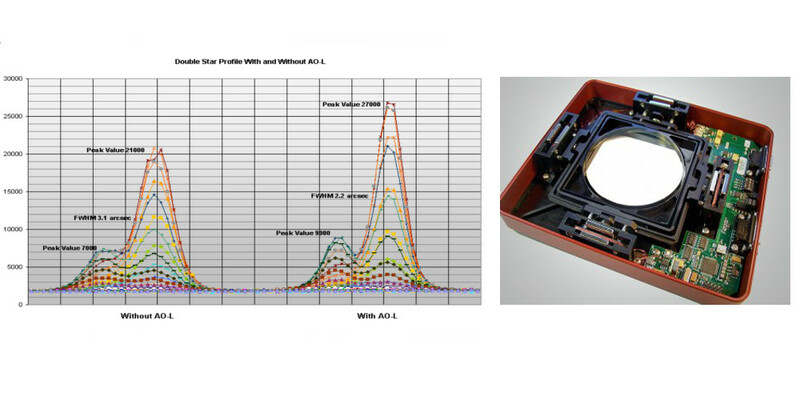 If the image drifts slowly during the exposure due to Periodic Error or slight misalignment of the mount, the AO can continue to operate without having to issue any corrections to the mount to re-center the guide star. This larger range of motion is one more advantage of the AO-8 over the earlier AO-7 design which worked best when making corrections within a narrower range, requiring mount calibration and interaction. The AO-X range is somewhat smaller due to the significantly larger optical element that must be used to cover the larger 16803 CCD. The AO-8T systems can be installed by the user to any STT cameras (or any former ST-7/8/9/10/2000/4000 camera with USB electronics). A camera equipped with the optional Remote Guide Head is required to use the AO with an off-axis guider. This remarkable system has had a profound effect on CCD imaging by reducing the atmospheric turbulence, wind induced vibrations, and eliminating the remaining periodic errors in most telescope drives. Some of the best, high resolution images we have seen produced by amateur astronomers have taken advantage of the AO technology introduced by SBIG. The results one can achieve with the AO-8T or AO-X depends on a number of factors and no two imaging sites are exactly the same. However, many years of experience with AO design and performance make it clear that SBIG's implementation and design of a closed loop AO offers a distinct advantage in image resolution, even when one has superior optics, mount and calm seeing. 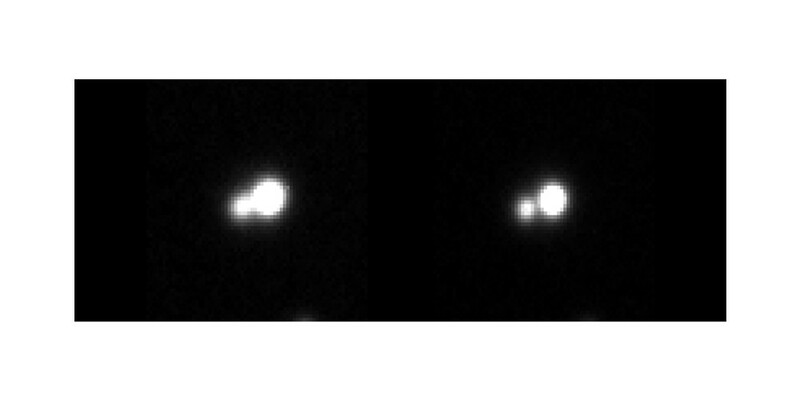 Take for example the test images below of the same double star captured with and without an AO operating. The brighter star is approximately mag 14.7 and the dimmer star is approximately mag 15.7. Separation is approximately 3.7". Two 15 minute images were taken one right after the other on the same night with an STL-11000M-C1 camera through a 20" F/8.3 RC scope mounted on a Paramount. The AO image clearly shows a tighter, brighter, better resolved stars compared to the non-AO image. The AO improved the measured FWHM (Full Width at Half-Maximum) and peak brightness of both stars by nearly 30%.